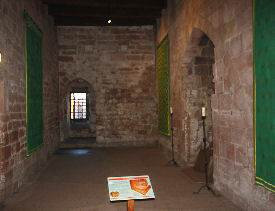 The Castle Hall was central to all activities in medieval castle life. In early castle construction, it was a very simple and basic affair - no more than a draft ridden and smoky room with just a hole in the roof. There would be no proper ventilation, rushes would be placed on the floor and maybe a couple of oak tables in the middle. The Lord and his family would sit at one end on a raised portion. Lighting was considered unimportant as most people tended to keep to the hours of daylight and if any lighting was necessary it was provided by means of smoky dips suspended over tallow. There were no glazed windows in these early castle halls so in bad weather they would have wooden shuttering closed over. As time went on, the Castle Hall became a much more important feature of castle design and became more commonly known as the Great Hall. It was in the Great Hall that the heart of medieval castle life was seen to beat most colourfully with the lord and his family, friends or guests taking food and wine here as well as being entertained, often on a lavish scale. Photograph: The Great Hall in the keep of Carlisle Castle - a keep which King David I of Scotland ordered to be completed in the 1130's. Many Great Halls had their own minstrels gallery from which musicians would play and provide entertainment and the walls of the Great Hall were often adorned with wonderful, impressive tapestries, trophies and coats of arms. From the 13th century onwards glazing was introduced into the windows of many Great Halls and this gave an added bonus of light during cold weather.